The XGS3-24242 provides 24 shared 100/1000Base-X SFP slots with 12 shared 10/100/1000Mbps copper ports, two optional 2-Port 10Gbps SFP+ uplink module slots in a compact 1U height format. Positioned as the distribution or aggregation layer switch of large networks, the XGS3-24242 supports IP Stackingtechnology that helps to manage and configure up to 24 units via one single IP address easily. It serves for campus networks and metropolitan IP networks by offering intelligent security features, high performance and flexibility. The XGS3-24242 can also be an excellent choice as a core layer switch for enterprises, data centers or small and medium-sized networks. 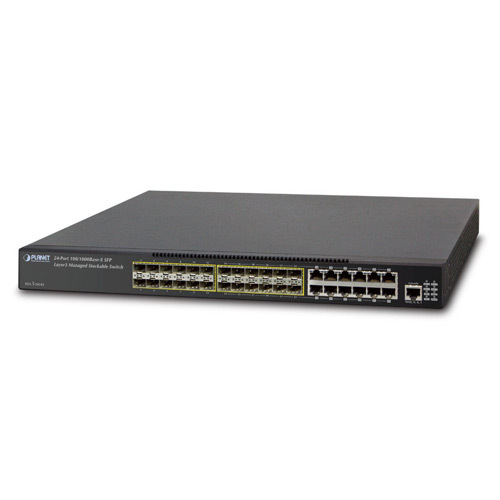 The XGS3-24242 Multi-layer Switch is an essential Layer 3 multimedia switch, which brings high-end security and traffic control to the edge of the network. 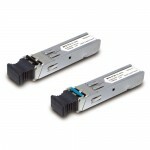 The XGS3-24242 offers multi port fiber optical connective capability and helps to extend the coverage of multi-layer routing services. With IP routing and multicast routing capabilities and flexible SFP interfaces, the XGS3-24242 is the ideal choice for the core layer of telecoms, campuses, and enterprises that need long reach and stability of IP metro access networks. 10Gb Ethernet, which adopts full-duplex technology instead of low-speed, half-duplex CSMA/CD protocol, is a big leap in the evolution of Ethernet. 10Gb Ethernet can be deployed in a star or ring topology. With 10Gb Ethernet technology applied, the XGS3-24242 provides broad bandwidth and powerful processing capacity. It is suitable for metropolitan networks and wide area networks. Using the XGS3-24242, users can simplify network structures and reduce cost of network construction. The XGS3-24242 supports various networking protocols to meet the requirements of complex network constructions. It is compatible with 802.1D/w/s, 802.1Q, 802.1p, 802.3ad, 802.3x, GVRP, DHCP, SNTP, etc. The Switch also supports multicast protocols including IGMP, DVMRP and PIM. Moreover, the XGS3-24242 complies with RIPv1/2, OSPF and IPv6. The XGS3-24242 provides AC/DC power redundancy. It can be deployed with 100~240V AC power input, -48V DC power input or 100~240V AC power/-48V DC power input simultaneously. The XGS3-24242 supports ACL policies comprehensively. The traffic can be classified by source/destination IP addresses, source/destination MAC addresses, IP protocols, TCP/UDP, IP precedence, time ranges and ToS. Moreover, various policies can be conducted to forward the traffic. The XGS3-24242 also provides IEEE 802.1x port based access authentication, which can be deployed with RADIUS, to ensure the port level security and block illegal users. 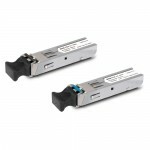 The XGS3-24242 switch fully supports DiffServ module. Users can specify a queue bandwidth on each port. WRR/SP/SWRR scheduling is also provided. The XGS3-24242 supports the port security to enable users to deploy trusted CoS, DSCP, IP precedence and port priority. Users can modify packets’ DSCP and COS values so the traffic can be classified by port, VLAN, DSCP, IP precedence and ACL table. User can also modify packets’ DSCP and IP precedence values to specify different bandwidths for voice / data / video to customize different qualities of service. The XGS3-24242 supports SNMP, In-band and Out-of-band Management, CLI and WEB interface, and RMON. It can mail the correlative sensitive information to the administrator abide by SMTP protocol. The XGS3-24242 supports SSH protocol to ensure the configuration management security of the switch. With 24 SFP fiber interfaces with 12 shared Gigabit ports and Layer 3 IP / multicast routing capability, the XGS3-24242 provides a cost-effective and high-performance solution for telecoms, network service providers and enterprises. With the built-in robust IPv4 / IPv6 Layer 3 IP and multicast routing protocols, the XGS3-24242 ensures reliable routing between VLANs and network segments. The routing protocols can be applied by VLAN interface with up to 1K routing entries. The high-density routing interfaces provide expandability to meet the growing network’s needs. Moreover, with the hot VLAN feature – Q-in-Q (VLAN stacking) supported, it allows the service providers to offer certain services such as Internet access on specific VLANs for specific customers and yet still provides other types of services for their other customers on other VLANs. The XGS3-24242 performs 128 Gigabits per second, non-blocking switch fabric so it can easily provide a local, high bandwidth, and Gigabit Ethernet network for backbone of your department. With the 24 built-in SFP ports, the XGS3-24242 provides the uplink to the backbone network through Gigabit Ethernet LX/SX SFP modules. It further improves the network efficiency and protects the network clients by offering the security and QoS features. Power Consumption 79 watts max. 2012-04-30 1.1 Add new model: XGS3-24242. 2012-02-24 1.0 Initial release for Command Guide. 2012-02-24 1.0 Initial release for Configuration Guid.